Looking across part of the 10 position, 25 yard firing point, for prone, .22 rifle shooting. 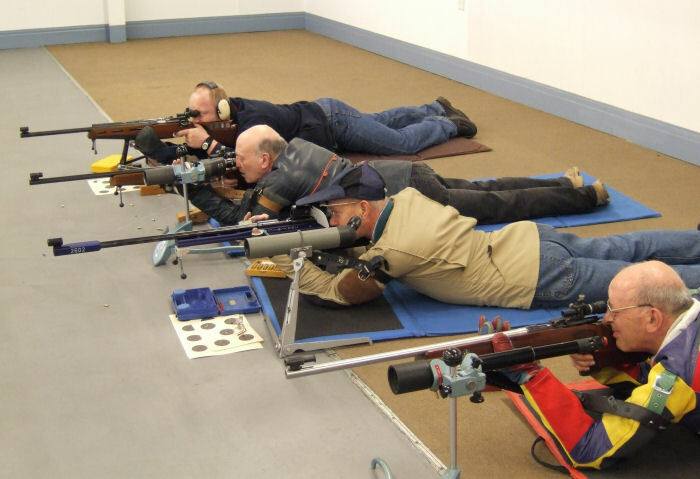 Eight of these positions (from 2 to 9) can also be used for standing and kneeling shooting, see: 25 yard range for a view of the target area. The 25 yard distance is measured from the silver strip at the front of the carpeted firing point and no part of the shooter can touch the floor forward of this line. All the guns shown in this view are single shot .22 rimfire cartridge firing. Note the use of spotting telescopes, so that the shooters can get instant feedback for every shot.